The blessing is to “acknowledge the important role that pets play in the lives of individuals and families as loyal companions who help to brighten our days”. 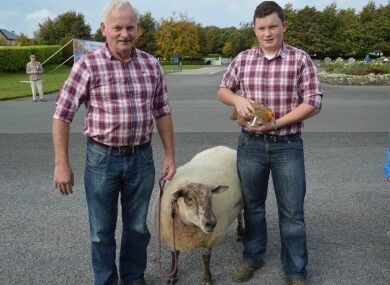 Ben Burke with his son Ben Junior from Foxford, Co Mayo with their pets, Polly the sheep and Penny the hen. IF YOU SAW a crowd of dogs, cats, ponies, sheep, chickens and some humans descending on Knock last Saturday, it wasn’t a miracle you were witnessing, but the Blessing of Pets at Knock Shrine. …acknowledge the important role that pets play in the lives of individuals and families as loyal companions who help to brighten our days and help to see us through difficult times. It was a relaxed and good humoured day in Knock. This is the second year the event has taken place – rerun again this year due to the sheer popularity of the festival. It all took place on the green, outside the Family Centre. This year the festival attracted a miniature pygmy goat, ‘Dancer’ the pony, Polly the sheep and her friend Penny the hen, as well as lots of cute puppies and dogs. Father Richard Gibbons led prayers and went amongst the crowd to bless all of the animals and their owners and sprinkle them with holy water. There was also music led by some members of the junior choir in Knock. Those that were not able to bring their pets sent in photographs which were mounted on the pet display board. The Blessing of Pets isn’t unique to Ireland either – it’s to mark the feast of St. Francis of Assisi (the 13th century Italian monk who is the Patron Saint of Animals). Email “Dogs, sheep, goats and people gathered at Knock for the Blessing of Pets”. Feedback on “Dogs, sheep, goats and people gathered at Knock for the Blessing of Pets”.